When people refer to a sound as being "fat" they usually mean different realities and consequently different practices. Here is an overview of the techniques most commonly used to easily get a fat sound. In this first article, we'll focus on guitars, which gives us the opportunity to discuss guitar doubling techniques. In many music genres, from rock to metal, a guitar is expected to have a massive and fat sound so that it fills the whole sound field... It's even expected to sound bigger than life like in Metallica's Enter Sandman, the White Stripes' Seven Nation Army, Almighty's Wrench, Queens of the Stone Age's No One Knows, Springsteen's Radio Nowhere or Rage Against the Machine's Killing in the Name, to name just a few. People who are not well versed in guitar sound often imagine that it's all a matter of amp size and output power, loudness or the gain/drive of a distortion or fuzz effect pedal. It would indeed be very stupid to assert that the low-frequency response of a 4x12 cabinet or the natural compression of a 100-watt head when it is cranked up aren't something to consider seriously when recording. But remember that, regardless of the output power and the loudness in front of the microphone, the track won't be louder. In fact, you'll have to decrease the gain of your microphone preamp to avoid clipping, and in the end you'll end up with the same signal level as with a 5-watt amp. Moreover, increasing the distortion on your amp or stompboxes won't bring better results either... Here is the proof: listen to the riff in Every Breath you Take by The Police. The guitar tone is fairly clean but it still sounds very wide. In short, this wide and full sound you like so much in some recordings is not a question of output power nor loudness or distortion amount. Or, to put it in other, more precise words, these factors won't guarantee a fat sound. Clean guitar tracks are often compressed in order to control the attacks, emphasize the sustain of the instrument or give consistency to a rhythm guitar track. It's a bit different with distorted guitar tracks: the amp's or stompobox's distortion tends to naturally compress the dynamic response of the signal, so it's not necessary to compress it further. When it comes to audio ─ and especially compression ─ less is often more, so avoid overdoing things. A fat sound means that the guitar fills the whole sound field as if it were always set at maximum. You must obviously consider several factors when it comes to a fat guitar sound. For example, you can compress your guitar tracks to reduce their dynamic range and emphasize their role within the mix, like INXS did with the guitar riff in I Need You Tonight. But apart from compression, which is especially effective with clean guitar sounds (see text box), the most effective and common way to fatten a guitar part is doubling. The idea is quite simple: if you want a guitar part to sound fat, record it a second time to an additional track. Do note that I said "record" it again. Don't just duplicate it by copy-pasting it in your sequencer because that won't achieve the expected effect. So play the guitar part twice and record it on two different tracks. Maybe you think you'll get two completely or almost identical guitar tracks, but there are thousands of micro-variations between both tracks that fatten the sound once they are mixed together. This effect is based on the good old unison principle you can hear in choirs, in the strings of a symphonic orchestra or in the singing of supporters in a soccer stadium. The fact that several persons play or sing exactly the same thing produces a richer sound, which most people will describe as more powerful, even if loudness has no influence here. Real or virtual amp? Or both? Note that doubling guitar parts works as good with real amps as with virtual amps, and nothing keeps you from combining both. This explains why many studios are equipped with POD or Eleven amps and myriads of amp simulations. They are very useful for doubling applications because they provide a very wide sound range while being easy to use. The sound turns a bit fatter, even if it's not obvious. But we're only starting. Now your guitar tracks sound fatter because they fill the audio spectrum a bit more than with a single guitar. But they will sound even bigger if you spread them across the stereo image. Listen to the result when one track is panned at 10 o'clock and the other at 2 o'clock. Better, isn't it? And why not take it even further? Fatter than doubling? Tripling, quadrupling, etc. Pan all your tracks to cover the stereo field and you'll get an impressive guitar wall. Just settle for four guitar tracks and focus on all available possibilities you have to fatten the sound, like using different and complementary guitar sounds. Remember that one of the goals of a "fat" sound is to fill the frequency spectrum, so it's easy to understand why it can be interesting to combine a rather dull guitar that has lots of lows with a rather bright guitar that has more high frequencies. In short, combine different colors to get a richer sound. And there are many ways to experience: change the selected pickup on your guitar, or change the guitar itself, use different amps, different microphones in different positions... And don't forget the sound variations that your amp provides and the 1001 stompboxes you could insert in the signal chain. The following example combines two takes recorded with the neck pickup of the guitar plus two takes recorded with the bridge pickup. Take, for example, the very typically American production of Joan Osbourne's One of Us. In the chorus there are distorted guitars left and right in the stereo field but you can also hear a tiny guitar with a sharp distortion that recalls a beehive right in the middle. This kind of lo-fi touch sharpens the overall fat sound in the high-frequency range. A tip for distorted guitars: the more you double the parts, the more you lose intelligibility. So it's very important to play as cleanly as possible with precise attacks and a perfect timing. Keeping a guitar track clean will help you have more detailed attacks. Regardless of its type (folk, concert or Gypsy), acoustic guitars also sound fuller when they are doubled. But since they produce stronger transients and less sustain ─ in other words they sound more detailed than distorted guitars─, be careful with doubling because you can lose intelligibility very quickly. 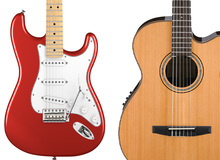 This being said, you can experience with both acoustic and electric guitars by combining different instruments and different microphone positions. You can also try mixed solutions. For example, combine an acoustic with an electric guitar like the Doobie Brothers in the famous riff of Long Train Running. When doubling a guitar part, you play the same thing twice and record two different tracks. But it could be interesting to introduce some very subtle variations, like different chord positions. You can play a D chord on the first three frets and then double it by playing a D chord at the 5th fret. You can transpose the chords one octave up or down, a technique often used with acoustic guitars in country music. You can also enrich the harmony by doubling a major chord with a major7 chord, although such solutions are more an arrangement than merely sound production. It is up to you to decide how to combine these different techniques to fatten your guitar parts. A whole new world is now open for you to experiment ─ and this is all the more true considering that doubling also applies to other signal sources. But that's something we'll discuss in a future article.